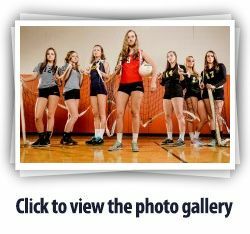 Announcing GameTimePA.com's girls' volleyball all-stars, led by Player of the Year Abigail Bentz of Susquehannock. Abigail Bentz, Susquehannock, sr.: Delone Catholic coach Jason Leppo said Bentz is one of the best players to ever come through the area. Don't believe him? She is headed to the University of Maryland and could play right away. Bentz led the Warriors in kills (269) and had a .263 hitting average. Her 47 aces also led Susquehannock from the service line, while her .928 serving percentage was second. How about some more stats? She had 231 digs, tied for second on the team, and did all this despite missing two weeks with an ankle injury. Warriors coach Rob Marrison tracked serve receive percentages — a measure of the passes that stay in play on your own side of the net — and said Bentz registered a 2.63 out of a best possible score of 3.0. The Warriors slipped into the YAIAA tournament but suffered a lower District 3 Class AA seed. In both tournaments, defending state champion Delone Catholic needed five games to dispatch a Bentz-led Susquehannock squad. "I can't wait to watch her on TV at the University of Maryland. It's going to be phenomenal," Marrison said. "Seven years as head coach, and that's my first big-time D-I recruit, so I'm pretty proud of that." Bentz expects to contribute immediately as a setter next fall for the Terrapins. She was named to the Pennsylvania Volleyball Coaches Association all-state team in Class AA. Maura Brehl, York Suburban, sr.: An outside hitter, Brehl's 266 kills led the Trojans to a share of the YAIAA Division II title. Last season, she played a crucial role in Suburban's upset of unbeaten Palmyra that sent the Trojans to the district finals. She has garnered college interest — including Lebanon Valley, Clarion, University of Pittsburgh at Johnstown and Lock Haven — while also posting 165 digs and 29 blocks as a senior. She also earned PVCA all-state honors in Class AA. Maddie Comly, Delone Catholic, sr.: A front-line hitter for the league champion Squirettes, Comly put down 178 kills and added 193 digs on the defensive side. An all-around athlete who is committed to Fairleigh Dickinson for basketball, Comly emerged in Delone's run last season to a Class AA state championship. She also had 35 aces this year and was a PVCA all-state honoree in Class AA. Jordan Landis, York Suburban, jr.: The defensive specialist helped in other areas for the Division II co-champs. Landis had 39 aces from the service line and showed a few more offensive flashes with 17 kills. Her strength, though, was still her defense with 341 digs. She helped the Trojans catch West York to share that division title. Katie Laughman, Delone Catholic, jr.: Laughman made the machine go in her second season as Delone's starting setter. She split time at the position last year, but with the job to herself this fall, Laughman posted a whopping 509 assists — not counting tournament play. Laughman, also a Squirettes basketball player with Comly, had 175 digs and 39 aces and also earned PVCA all-state honors in Class AA. Lauren Reichard, Eastern York, sr.: A Georgia Southern recruit, Reichard was arguably the league's fiercest player at the net. The Golden Knights just missed YAIAA tournament play despite tying Susquehannock for the final spot from Division II. Eastern rebounded to a district semifinal run that ended against Delone Catholic. Reichard finished the season with 421 kills, 212 blocks, 152 digs and 21 aces — totals that include non-league matches and the postseason. She was a PVCA all-state selection in Class AA. Sarah Senft, Delone Catholic, jr.: Like Comly, Senft also emerged last year as an all-around threat in Delone's 2014 PIAA title run, when she was just a sophomore after transferring from Spring Grove. In her second season in coach Jason Leppo's system, Senft had 158 kills, 125 digs, 31 aces and 25 assists. Heather Schoemaker, Red Lion: In her third season, the Lions improved by nine victories and made the YAIAA tournament championship match — a first for Red Lion since its last tourney appearance and title in 2006. Schoemaker took the Red Lion job after serving as an assistant at Susquehannock under Marrison. She guided this year's Lions to a 16-5 record, including a 10-2 YAIAA Division I finish after handing eventual division champ Central York its only regular-season league loss. "These girls in the last several years have gotten progressively better," Schoemaker said after the YAIAA tournament. "There's so much more potential for a lot of these girls." Cheyenne Altland, Delone Catholic, sr.
Lindsey Blevins, Red Lion, so. Allison Rife, Central York, jr.
Madyson Whitcomb, Bermudian Springs, jr.
Kari Lankford, West York, sr.
Julia Terpak (setter), Central York, sr.
Kerrie DeFelice (libero), Susquehannock, sr.
Bermudian Springs: Gabrielle Emeigh, Cheyenne Topper. Central York: Emily Poole, Andrea Quartey. Dallastown: Sophia Messner, Kat Forry. Delone Catholic: Kayla Baadte, Lilly Singleton, Amber Johnson. Gettysburg: Myla Manahan. Northeastern: Bayle Sowers. Red Lion: Brooke Daugherty, Jenna Hevner. South Western: Tori Sager, Hannah McMaster. Spring Grove: Mia Bennett. Susquehannock: Brittney Fitzgerald, Kelly Franz. West York: Alexis Harbold, Dixie Miller, Shaina Robinett. York Catholic: Natalie Stewart, Meredith Beecher. York County Tech: Brooke Glass. York Suburban: Ciara Buckingham.